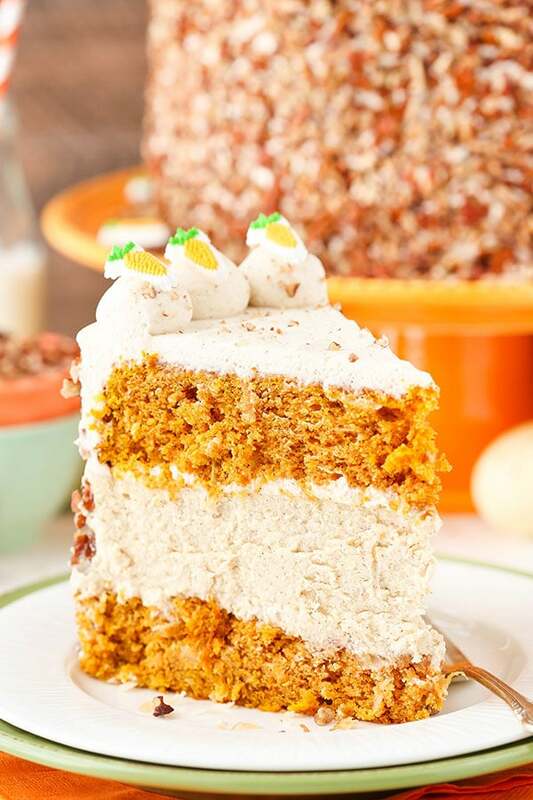 This Carrot Cake Cheesecake Cake has two layers of super moist carrot cake and a middle layer of creamy cinnamon cheesecake! 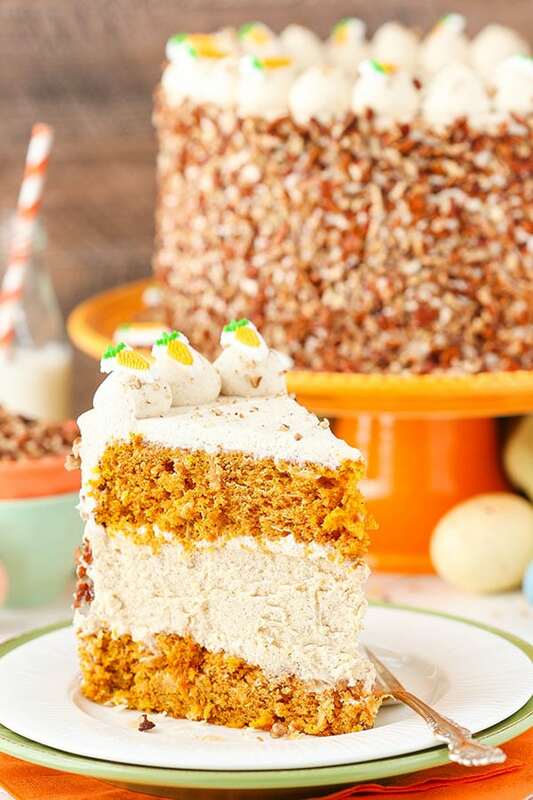 It’s covered in cream cheese whipped frosting and is the perfect cake to celebrate Easter next month! So speaking of Easter (and you know, Easter eggs), I had a pretty funny conversation with my cousin and her husband over this last weekend. I was visiting them in Chicago and since I’m gearing up to hopefully get started with IVF next week, I’ve been eating a little differently than normal in order to help my eggs develop as well as they can. I’ve been easting much healthier – as in mostly meat, veggies and fruit. 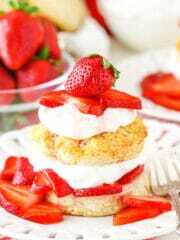 Very little (if any) bread, pasta, potatoes, sweets (AH!! ), etc. So my cousin and I were explaining this to her husband so he’d understand what was on and off limits. He focused on the veggie part of the diet and then compared it to maybe the funniest thing I’ve ever heard – the slogan on their egg carton. “Girls on grass, free to forage!” I’m not sure I’ve ever laughed so hard while comparing myself to grass-eating and foraging chickens. So the joke for most of the weekend was how I was foraging. 🙂 Clearly I should go hang out with some free-range chickens. Definitely the hardest part of my current eating situation is not devouring all of the desserts. Of course I still have to taste things – I couldn’t possibly tell you how good they are without tasting – but then I have to give it away. *hangs head in sadness* It really is torture. I can tell you after my tasting of this cake that this one was especially torturous. 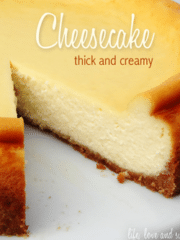 This cake is a mix of two of my favorite kinds of eat dessert – cake and cheesecake. Putting them both into one cake is pure genius. I had a request for this cake late last year and I’ve been dying for Easter to get close so I could share it! 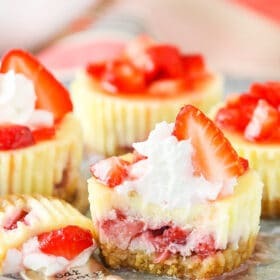 This cake starts with the cheesecake. It takes the longest to cool and set, so I often make the cheesecake the night before I put the cake together. You could also make the cakes the night before, if you wanted. I like to make sure that I use the same cake pan for both the cake layers and the cheesecake so that they all end up being the same size. My springform pan turns out a slightly larger cake. To make it easy to remove the cheesecake from the cake pan, I line it with aluminum foil and press it firmly into the bottom and up the sides of the pan. The final cheesecake is nice and firm so that it’s easy to move around and layer onto the cake. The creamy cinnamon-flavored cheesecake goes perfectly with the spiced carrot cake. You might be a little surprised by part of the method with the carrot cake. 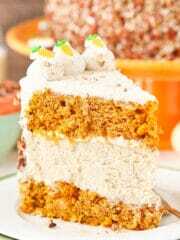 Rather than using shredded carrots, like most carrot cakes do, this cake uses steamed carrots that are pureed. I tried a carrot cake with this method years ago and now I never make carrot cakes any other way. You really get the carrot flavor and it makes such a moist cake. You could compare it to making a pumpkin cake with pumpkin puree. 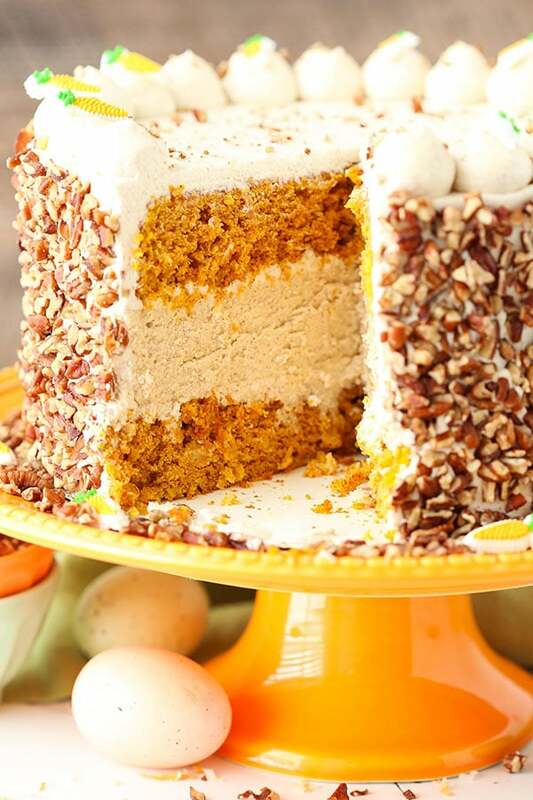 Imagine the difference between shredded pumpkin and pumpkin puree in a pumpkin cake. The puree adds so much more flavor! LOVE! I also like to include some coconut and pineapple in my carrot cake. I love the flavor of both and think the pineapple adds additional moisture. If you aren’t a fan of one of them in your carrot cake, feel free to leave it out. 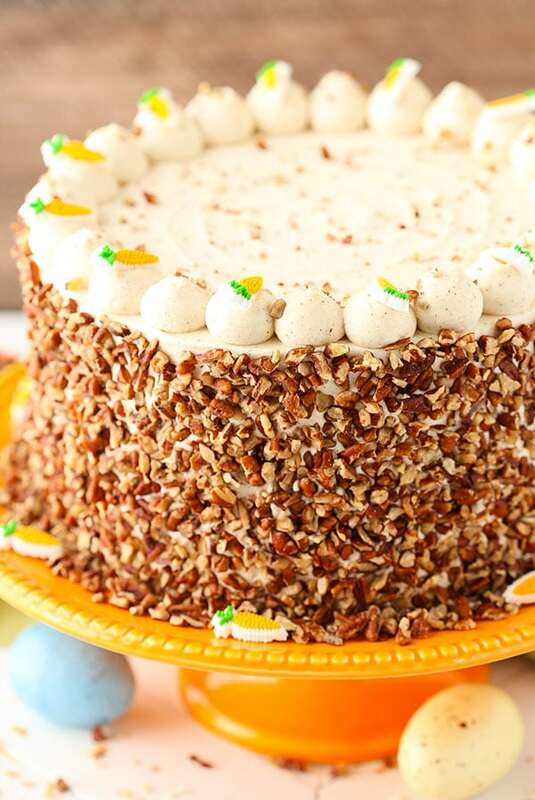 The whole cake is frosted with cream cheese whipped cream frosting, which is perfect with the carrot cake! Plus, the cake itself is relatively heavy with all the cake and cheesecake, so the lighter frosting is nice. On the outside, I’ve added the pecans as decoration. This whole cake is SO darn good! 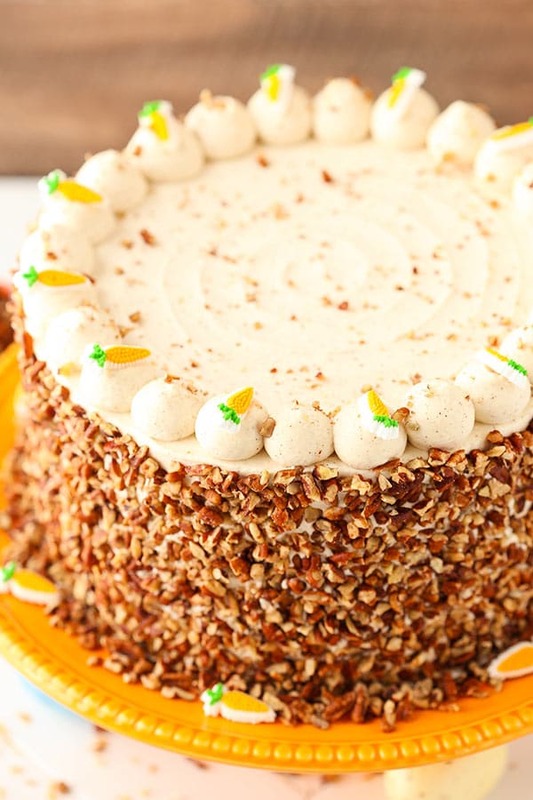 The carrot, the coconut, the pineapple, the spices! And the cinnamon cheesecake! What is there not to love?! 1. Preheat oven to 300°F (148°C). Line the entire inside of a 9 inch cake pan with aluminum foil. Press it into the pan to get it as flat as you can. You’ll use the aluminum foil to lift the cheesecake out of the pan when it’s baked and cooled. 10. To steam the carrots, bring about an inch of water to a boil in the bottom of a pot. Put peeled carrots in a steamer basket (or a colander, if you don’t have a steamer basket) set over the boiling water. Cover and steam the carrots until very tender, about 10-15 minutes. 11. Put the warm carrots into a food processor and puree. You should end up with about 1 ¾ cup (420ml) of carrot puree. Set aside to cool. 12. Preheat the oven to 350°F (176°C). Line the bottom of two 9 inch cake pans with parchment paper and grease the sides. 15. Add the eggs one at a time, mixing until incorporated after each addition. 21. Stir in the crushed pineapple and coconut flakes. Scrape down the sides of the bowl as needed to ensure everything is well combined. 22. Divide the batter evenly between the prepared cake pans. 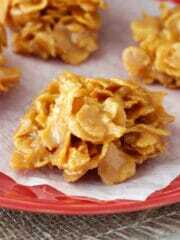 Bake for 30-35 minutes, or until a toothpick inserted in the middle comes out with a few crumbs. 31. Frost the outside of the cake. 32. To create a spiral pattern on the top of the cake, lightly press an offset spatula into the center of the cake. Gradually move the tip of the spatula outward as you spin the cake around, creating the spiral. 34. Pipe dollops of the whipped frosting around the top edge of the cake. I used the Ateco 808 icing tip. 35. 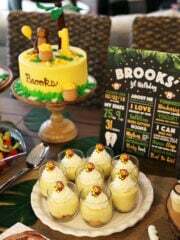 Finish off the cake with some candy carrots or other carrot decor. 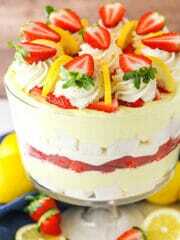 Store the cake (in an airtight containter, if possible) in the refrigerator until ready to serve. Cake is best for 2-3 days. Wow! 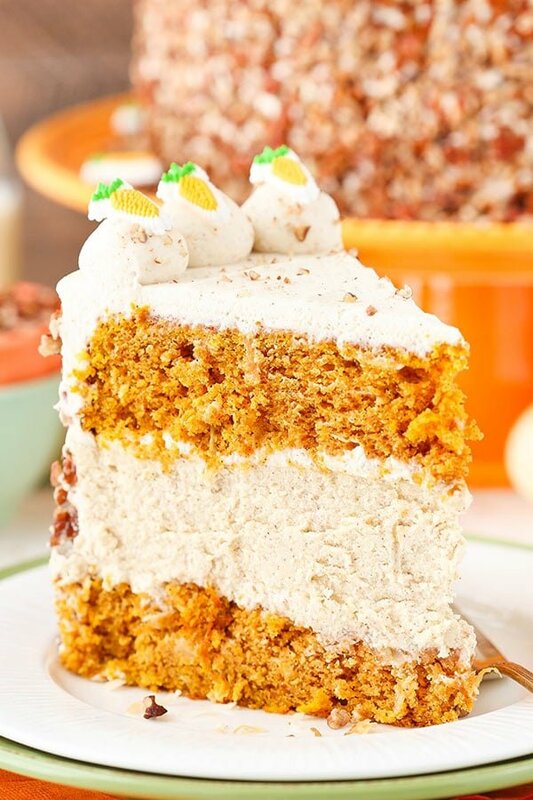 Carrot Cake and Cheesecake!?! 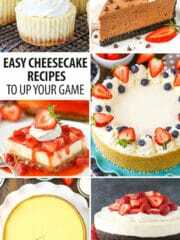 Carrot cake is my fav and I love cheesecake! 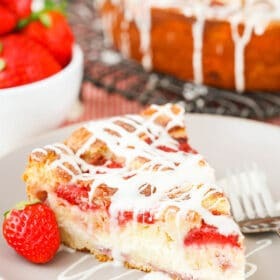 I will have to make this. Thanks for sharing Lindsay! This looks amazing!! What a perfect combo!!! Could I leave out the crushed pineapple and coconut flakes in the cake batter or would that change the outcome of the cake? The cake is beautiful!! Will keep you in my prayers for your IVF. Carrot cake is my fav and I love cheesecake! 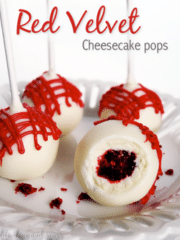 I will have to make this. Thanks for sharing Lindsay! Once again, another delicious cake. I made it for a professor, so I wasn’t able to try any, but I had some spoonfuls of batter and frosting as I went and it tasted delicious. The only problem I had with it was that the top layer slid around a lot during the transportation. Maybe I just need to add an extra layer of frosting help the top layer to stick? Did you add some of the whipped cream frosting between the layers? That should help things stay in place. Glad you were happy with it! 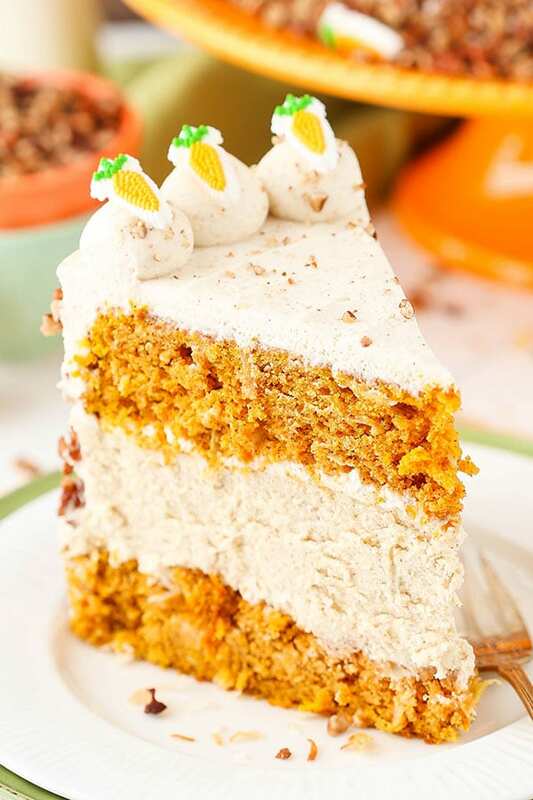 I stumbled upon your site for the first time yesterday morning and was very intrigued by this recipe, it looks exactly how I want to enjoy carrot cake… with cheesecake! It just so happened that a few hours later my friend requested a carrot cake for his birthday that night – a great excuse to try a new and exciting recipe! So I ran out of the house to grab the ingredients and 5 hours later we were all enjoying a WONDERFUL and moist cake. I made a 1/2 portion of the cheesecake and 3/4 portion of frosting so it had naked sides, but it was a perfect ratio for us. Everybody (including myself) was impressed with how this cake looked and tasted. The carrot cake especially was super tasty and baked up really well. Thanks for a great recipe! If I was to slice the cheesecake in two halves or bake the cheesecake in two pans, therefore creating 2 layers of carrot cake and two layers of cheesecake alternating, do you think the cake would be able to withstand the weight of the cheesecake? 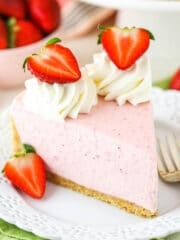 I may make this as a 7″ or 8″ cake for Easter, what kind of baking time adjustments do you recommend with the cheesecake? I’ve never really been good at adjusting cheesecake pans and baking times. I would think that’d be fine. If you go from 9 inches to 8 inches, it will be a very tall cake. It’s already quite big. 🙂 I haven’t ever made a cheesecake as an 8 inch, o I’m not sure about baking adjustments. Just look for it to be well set on the edges. It can still be a little jiggly in the center when you turn off the oven to start the cooling process. It’ll continue to cook. Gosh, I’ve never used one of those ovens so I have no idea. Sorry! Hi! Is it possible to use the already puréed baby food carrots instead of steaming your own carrots? Thanks. Can’t wait to try this! I would think it’d probably be ok as long as there isn’t really anything additional added to the baby food. Definitely worth trying! I made this for Easter and it was outrageous! It was absolutely delicious, and let me tell you, this is a HUGE cake! Such a great recipe! Thanks again for another winner! I’m so glad you enjoyed it – definitely a big cake! 🙂 Thanks Michelle! Hello! My name is Anna, I’m from Russia! Thanks for your recipes! With pleasure I read and prepare them! It’s fine!!! Hi Lindsay, can you tell me what the name of the decorations on this cake? They are carrot shaped icing decorations by Wilton. So i really want to make this cake for Easter, but we are going to two different family events. 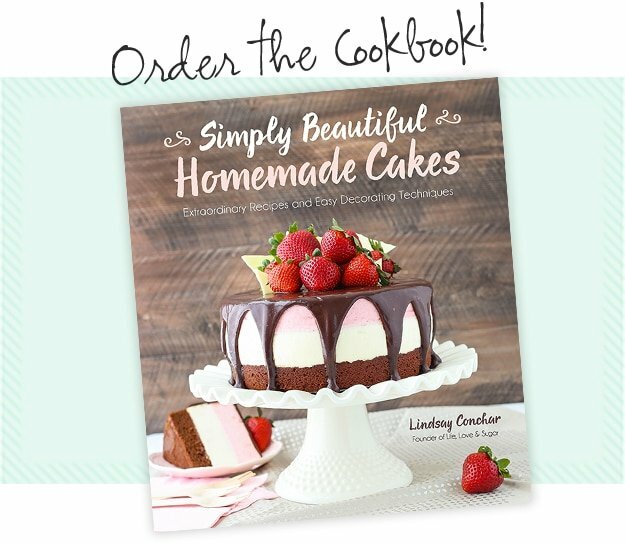 I was wondering if you thought this recipe was enough to make two 5 or 6″ cheesecake cakes? Hmm, I haven’t really made any cakes that size, so it’s hard for me to say. The cake seems to be way too wet… same as the vanilla cupcakes. Normally I’m very good cooker and backer ???? Everything is so delicious but the consistency. I’m wondering if it has something to do with the conversion to grams as I live in Europe or the ingredients are so different? .. It shouldn’t be an issue with the grams. I actually bake with those, so they are accurate. Are you testing things before you pull them out of the oven? If they are still wet, it sounds like they need to be baked longer. I like to use a toothpick and insert it into the center of the cake/cupcakes. If it comes out wet, it’s not done. You usually want to see either a few crumbs or nothing at all sticking to the toothpick so you know it’s done. The carrots should be pureed without the water in the pot that was used to steam them. 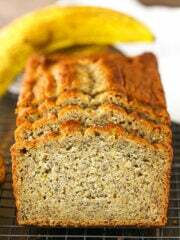 Once pureed, there’s no excess water to squeeze out. You do want to drain the pineapple though.